There are many renowned institutions in the world which are the incubators for the greatest minds in all spheres of life. History knows them with names like Tim Berners-Lee (computer scientist), Noam Chomsky (linguist), Edwin “Buzz” Aldrin (astronaut), Richard Feynman (theoretical physicist), James Doolittle (air ace), Kofi Annan (diplomat), just to name a random few. The list of Nobel Laureates is pretty long as well. The one common thread in all those names? Massachusetts Institute of Technology. Immersion is an experimental Gmail visualization tool that helps you see the interconnectedness of your email contacts. The tool taps into the email metadata and creates a visual map that tells you at a glance the people whom you connect to more frequently; the amount of emails you have sent and received; the frequency of your emails; the new contacts and how you connected to them etc. The interactive bubble map differentiates your email groups by color and you can dive into individual bubbles and explore them further. You can segregate your interactions with time and analyze how your email habits have changed over its course. Immersion does not read or store the contents of your email. Once you log-on with your Gmail account, Immersion will use only the From, To, Cc and Timestamp fields of the emails in the account. We know about the cities we live in through our life experiences or through media reports. But what if there was a quantitative measure the common man without a statistical degree could understand? Place Pulse tries that approach by crowdsourcing information and comparing cities according to its “aesthetic capital” – how wealthy, modern, safe, lively, active, unique, central, adaptable or family friendly a city potentially is. The aim of Place Pulse is to use a visual survey and even quantify things like, which neighborhoods in Bangkok are better than neighborhoods in New York City based completely on human perception i.e. how we view a city and what we think about it. The tool is still a work in progress, but you can see how it has been used to map 56 cities across the globe on the subject of safety. Similar to the “hot or not” approach, two images are presented for viewer feedback. The milestone the team is aiming for is to get feedback on 3,000 photos of five cities: Vienna, Linz, Salzburg, Boston, and New York. Health Map is a real-time epidemic tracking application that is available as an Android and iPhone app (Outbreaks Near Me) as well along with the website. Public health workers can use the information to monitor health issues around the world. The information is collected from different sources like news aggregators, online discussions, publicly available datasets, health alerts etc. Health workers and researchers can use the global or the local maps to study how outbreaks are occurring around the world and their deep-seated reasons. Personas was originally an interactive experience and a live exhibit at various locations around the world to demonstrate the power of sophisticated natural language processing using the Internet as a data source. Personas is interesting because it visually tells you how the Internet sees you. Simply enter your name, and Personas mines the Web for information and attempts to characterize you around a set of categories. It displays the information on a color coded chart. It is an encapsulation of your digital life and digital history. Note: Personas seemed to be temporarily down at the time of writing this article. Scratch needs little introduction because it is one of the more well-known applications to have come out from the MIT Media Lab and something kids can take to right away. Scratch is a programming language that can get your kids enthused about computer science and creating things with just a computer. We took a brief look into Scratch 10 Tools To Get Kids Excited About Programming 10 Tools To Get Kids Excited About Programming For the average kid, computers and smartphones are fun tools. Education comes much later. Getting a kid excited about programming might take some doing because logic needs a bit of time to develop. It is... Read More a few years back and it always earns a mention whenever we talk about teaching children how to program 10 Tools To Get Kids Excited About Programming 10 Tools To Get Kids Excited About Programming For the average kid, computers and smartphones are fun tools. Education comes much later. Getting a kid excited about programming might take some doing because logic needs a bit of time to develop. It is... Read More . Scratch also helps to teach kids about the basic concepts of design. Using Scratch is simple and there are quite a few online resources around it thanks to MIT’s efforts. From one educational programming language we come to another. StarLogo TNG is a version of LOGO written in Java. In brief, it is a game modeling environment which can be used to teach how different entities (“blocks”) can be made to interact together and react to the world around them. It can be used to create educational video games with 3D graphics, sounds, and user inputs. And, without the complexity of advanced simulation programs. MIT contributes a lot to the inclusiveness of technology and education. Some of you would know about App Inventor which is looked after by MIT now (it was a Google project originally). MIT Media Lab is one initiative that brings technology out into the open with more focus on the day-to-day interplay with the real-world. 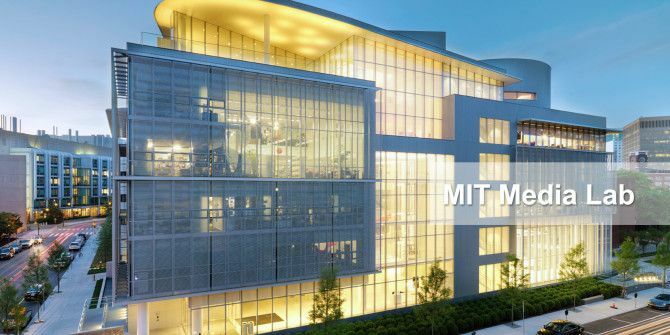 Financial Times went behind the scenes at MIT Media Labs and you can too. More importantly, you can try out these six tools and tell us their value in the scheme of things. Great article Saikat! I had no idea MIT produced so many highly useful software. In particular, it looks like StarLogo TNG might be of use to beginners for learning how 3D graphics fit into an object-oriented programming language. Thanks for the read! Thanks Kannon. They have a huge list of ongoing projects. The spinoffs from their work is really path-breaking as well. For instance, 3D holographic printing is a spinoff if I am not wrong. Check out the gallery here -- http://www.zebraimaging.com/gallery. Cool products like LEGO Mindstorms and Guitar Hero were also based partially on the work done there! Personas is back again online. Wow, I didn't know Scratch originated from MIT! Thankfully, it was a temporary glitch. The list of inventions and innovations is long. It has items like the Gillette Safety Razor, PET scans, condensed soup, RSA encryption, the first air-conditioned building, and of course -- the Web and email. Yes, down again for the moment.